Edward Gillespie is one of the most familiar faces around Gloucestershire. He was the main man at Cheltenham Racecourse for more than three decades and has immersed himself in a whole host of other activities – by no means all sport related – over the years. He’s a busy, busy man and his life has got even busier since the end of October when he took on the role of Lord-Lieutenant of Gloucestershire, a role which sees him take on a full range of civic and ceremonial duties while representing the Queen in Gloucestershire and South Gloucestershire. And it’s a job he is delighted to be doing even though he admits that it wasn’t something he was planning on when he stepped down as managing director of Cheltenham Racecourse in late 2012. And there’s every reason to presume that Gillespie, with all the gravitas that he brings to the role, will continue in the ceremonial position deep into the 2020s. Part of that role sees him working very closely with the Royal Family and when he spoke to The Local Answer he was making preparations for The Princess Royal’s visit to Gloucester, Yate and Thornbury early in the new year. 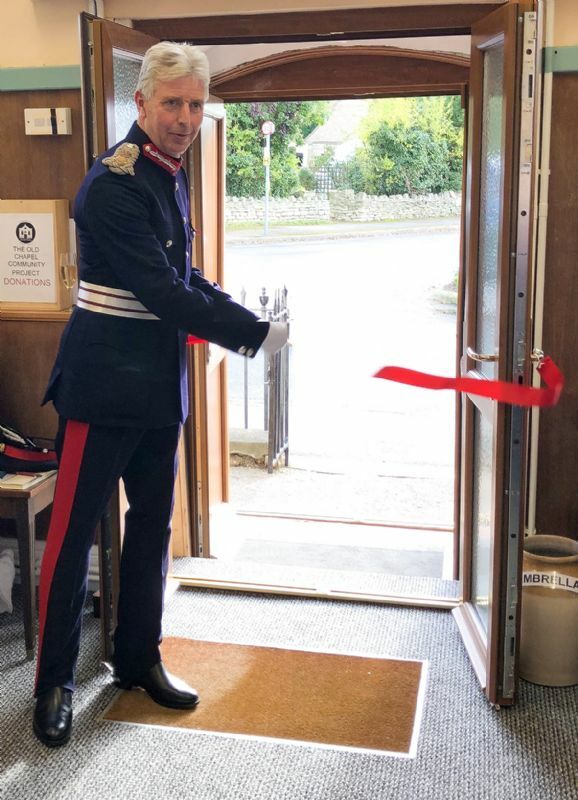 “The key to a visit such as this is that as many people as possible get to meet The Princess Royal and feel part of the occasion,” explained Gillespie. That visit on Tuesday 8th January will be a high-profile event and one that Gillespie is very much looking forward to. But there are plenty of other aspects to the role of Lord-Lieutenant of Gloucestershire which Gillespie is keen to champion. They include promoting the military in the county, promoting and celebrating volunteers – “The county is chock-full of volunteers who do remarkable things,” added Gillespie – and celebrating civic contributions. “There are so many facets to the role and I’ve got a wonderful team supporting me at Shire Hall,” Gillespie continued. He estimates that he spends about two days a week on his new role and is grateful to the support he receives from his Vice Lord-Lieutenant, Robert Bernays, and more than 30 Deputy Lieutenants. “Everybody has their own talents and expertise and it’s important to say that we don’t just cover Gloucestershire, we cover South Gloucestershire as well,” said Gillespie. There are some 400 events each year that the Lord-Lieutenant’s office is required to attend and although there is no salary for the position of Lord-Lieutenant or Vice Lord-Lieutenant, their expenses are covered. Gillespie, who was awarded an OBE in 2015, became a Deputy Lieutenant in 2005 so he had a good grounding before taking on the top job. And one of his first engagements on becoming Lord-Lieutenant of Gloucestershire was just a stone’s throw from his home in Gotherington, near Bishop’s Cleeve. Born in Surrey and educated at Tonbridge School in Kent before studying politics at York University, Gillespie, a married father-of-three and now a grandfather, moved to Gloucestershire in 1980 when he landed the top job at Cheltenham Racecourse. And while he is best known for the 32 years he spent as the main man at the home of National Hunt racing, there are many, many other areas where Gillespie has worked in the county for the common good. He served on the Board of The Everyman Theatre, which he chaired for 10 years, and was chairman of Gloucester Cathedral Council. He is also on the Board of Cheltenham Festivals and is still chairman of the Music Festival. He is an Honorary Fellow of the University of Gloucestershire, an Honorary Freeman of the Borough of Cheltenham and is chairman of the trustees of the Summerfield Charitable Trust. It’s a very impressive CV and there are new additions being made all the time because he was made chairman of the Pony Racing Authority in January 2013. Pony racing is a sport close to his heart of course and sport remains a big part of Gillespie’s life because he works a couple of days a week for top trainer Jonjo O’Neill, who is based in Temple Guiting. But what he does do is still play bridge and golf – “I play both badly,” he chuckled – and he also still plays cricket for Gotherington for whom he is also fixture secretary. Gillespie, by his own admission, is more Boycott than Pietersen in terms of the speed of his runscoring, so which is his favourite shot? Ask him what his favourite sport is and he’ll say in that wonderfully exuberant and energetic way of his: “That’s impossible to say,” before adding, after a moment’s thought, “in the summer it would have to be cricket. In the winter it’s a toss up between Cheltenham Town – I’m not a big football fan but I love Cheltenham Town – and rugby, I love rugby. I watch Hartpury quite often, they are a very good standard. “I also love the jumps racing but I can get passionate about anything, even ice skating. Gillespie knows all about big occasions having been the driving force behind the growth and success of Cheltenham Racecourse for so many years. So what gives him most pleasure when he looks back at his time in charge at Prestbury Park? “The fact that everyone is so passionate about it,” he said. “People have the same passion for Cheltenham Racecourse that they have for Gloucester Rugby or their football team. “It’s got underneath people’s skin and it’s not just that, it’s the breadth of the appeal. Before, it was just racing people but now Cheltenham racing dates are one of the first things that people put in their diaries. “It’s the same for owners, jockeys, trainers, spectators; it’s extraordinary. Gillespie is still a regular at Prestbury Park on racedays but these days only as a punter.